EasyNoter offers all essential functionality of a personal organizer. ArtPlus Easy Noter Pro 4.5 was available as a giveaway on March 13, 2016! Still Haven't found that personal information manager (PIM) software that will work with you instead of against you? EasyNoter is a straight-forward easy-to-use PIM with all the power and flexibility you'll probably ever need. EasyNoter offers all essential functionality of a personal organizer, packed in stylish and most of all, user friendly interface. Not only does it look good, it's very practical and easy to use. It will help you organize your notes and addresses, keep diary, or get reminded about important tasks. How would you improve ArtPlus Easy Noter Pro 4.5? Import your own design/photo for the book cover. Featured titles by Art Plus Inc. Recover deleted images and videos from your digital camera memory card! 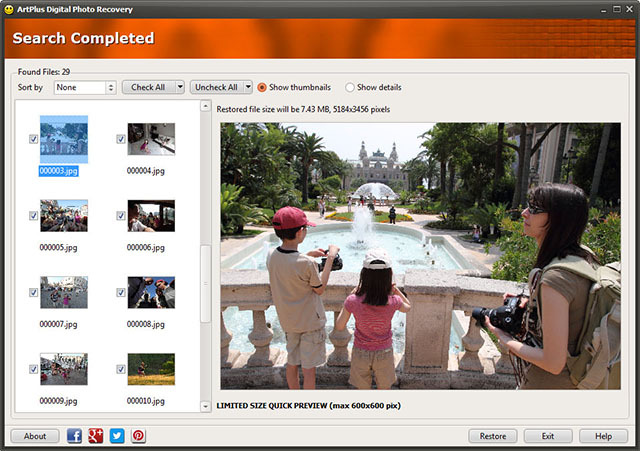 This program will help you recover lost images, videos or music files from deleted, accidentally formatted or even corrupted digital camera or mobile phone memory cards. Special offer! Buy now at $9.95 (regular price $24.95). Just enter "ePix" into the Gift Code field here. It looks like many of you missed to update the program two weeks ago, as instructed in the IMPORTANT ANNOUNCEMENT on March 15. You may again experience similar symptoms on or after April 1. You can still update the program by initiating updates through the Tray. When you try to run the program you'll get the dialog asking you to enter the license code. At that moment, while this dialog is still open, move your mouse to the Tray (bottom right, near the clock). You should see EasyNoter icon there. If you don't, you'll see a small arrow pointing up, click on it and you'll see EasyNoter icon in the pop-up window. Right-click EasyNoter icon and select "Check for Updates". The program will connect to our server and display a list of available updates. There should be few skins and only one update. Click the blue link saying "Update"
When the procedure is finished, you should be able to open the program again. SOLUTION TO INVALID OR MISSING LICENSE PROBLEM It looks like many of you missed to update the program two weeks ago, as instructed in the IMPORTANT ANNOUNCEMENT on March 15. You may again experience similar symptoms on or after April 1. You can still update the program by initiating updates through the Tray. When you try to run the program you'll get the dialog asking you to enter the license code. At that moment, while this dialog is still open, move your mouse to the Tray (bottom right, near the clock). You should see EasyNoter icon there. If you don't, you'll see a small arrow pointing up, click on it and you'll see EasyNoter icon in the pop-up window. Right-click EasyNoter icon and select "Check for Updates". The program will connect to our server and display a list of available updates. There should be few skins and only one update. Click the blue link saying "Update" When the procedure is finished, you should be able to open the program again. If you missed to update the program two weeks ago, as instructed in the last IMPORTANT ANNOUNCEMENT, you may again experience similar symptoms on or after April 1. If you do, let us know through ARTPLUS SOFTWARE WEBSITE support form http://artplussoftware.com/support. There is a simple fix but you may have to download the patch from our site. We'll send you the details via email when you contact our support. IMPORTANT Hi all! If you missed to update the program two weeks ago, as instructed in the last IMPORTANT ANNOUNCEMENT, you may again experience similar symptoms on or after April 1. If you do, let us know through ARTPLUS SOFTWARE WEBSITE support form <a href="http://artplussoftware.com/support">http://artplussoftware.com/support</a>. There is a simple fix but you may have to download the patch from our site. We'll send you the details via email when you contact our support. I'm glad to see so many comments here, but at the same time it's almost impossible to track all your questions. That said, please contact us directly through http://artplussoftware.com/support if you need assistance. It's possible, and even likely, we'll miss your questions if you simply post them here! As we mentioned earlier, there was a bug in GOTD version of EasyNoter that forced the program to validate the License code unnecessarily each day. If it could not connect to the Internet, EasyNoter would reject the code and display "License Expired" message. Due to this bug you were unable to use EasyNoter offline, or behind firewall. We issued a fix to this problem as a regular program update. To apply the fix, open EasyNoter, click "ABOUT" and then "Check for Updates" button. Find "ArtPlus EasyNoter PRO 4.5.8.805" on the list and install it. Installed and registered easily on a windows 7 pro 64 bits machine. But after using it and closing it, it won't restart right away. I have to wait for at least 1 minute, then a small window opens telling me that I have not enough ressources (I have a lot! ), then another window opens asking me for my license key... (but I saw they are going to make a patch for this problem, hope it will be soon enough). Each time I want to open it I have these same problems! Actually, this is not the same bug! The bug that was just fixed is not asking you to enter the code, but simply says it's "expired". Developer, Well it was not the same bug but your update fix it anyway! And it fixes also my problem of slow opening... So thank you for this update! Now I can enjoy plainly your nice software... I just have a question: is this giveaway included futures program updates or do we loose the license if we update? I copied the EasyNoter folder in: User\Roger\Programs\Art Plus *. * to a USB drive. Opened on a third computer with Internet access and the same issue on that computer. I cant add any NEW FORMS and TYPE NEW TEXT in the Forms lables or and new notes. If I create a NEW FOLDER \ with CREATE NEW FORM the same. I cant add test to labels / notes. Help. <b>roger sweeney</b> I copied the EasyNoter folder in: User\Roger\Programs\Art Plus *. * to a USB drive. Opened on a third computer with Internet access and the same issue on that computer. I cant add any NEW FORMS and TYPE NEW TEXT in the Forms lables or and new notes. If I create a NEW FOLDER \ with CREATE NEW FORM the same. I cant add test to labels / notes. Help. 1. Auto re-position on screen. When going from closed to open. Going from one computer to another with different resolution. 2. Better backup GUI. When doing a backup you must pick the FOLDER ONLY. When doing a RESTORE it goes into the folder, confusing. 4. Making a REMINDER need to be more clear, confusing. <b>roger sweeney</b> This software needs work..... 1. Auto re-position on screen. When going from closed to open. Going from one computer to another with different resolution. 2. Better backup GUI. When doing a backup you must pick the FOLDER ONLY. When doing a RESTORE it goes into the folder, confusing. 3. Better install. Some files don't work on X64 Win7 like they should. On first run work fine but after close and reopen you cant type any new text or make new note. (Registered version) 4. Making a REMINDER need to be more clear, confusing. It's possible that you installed the program with administrator privileges to a folder where EasyNoter is not allowed to write data. However, I can't be sure based on information your provided here. Describe step by step what you're doing and list all the results you get, also step by step. We'll see what we can do. <b>roger sweeney</b> It's possible that you installed the program with administrator privileges to a folder where EasyNoter is not allowed to write data. However, I can't be sure based on information your provided here. If you wish, we can try to help, but we'll need more information about it. You should contact us through http://artplussoftware.com/support Describe step by step what you're doing and list all the results you get, also step by step. We'll see what we can do. Downloaded and Installed fine; never could get the registration page to load however and I have no security software to disable. Works like a charm! At first I couldn't register. Kept getting license expired message. But it worked when I unblocked it in firewall. Nice one. I like it a lot. Installed fine on Win 10 Pro 64 bit. I use MSoft OneNote for a lot of things and was curious if this could replace it. It doesn't have the same ease of use as the $60. OneNote but it offers useful note taking that can be handy and searchable. The application does some things better than OneNote such as the contacts and diary. The photo function is very limited and doesn't add much value but I'll keep it and see if it becomes a more useful tool vs OneNote. I won't be downloading this because I have easynoter already. I have used this address system for years and think it's the very best! So many features and so easy to use - can't live without it! I won't be downloading this because I have easynoter already. I have used this address system for years and think it's the very best! So many features and so easy to use - can't live without it! Reminder is not working ?? I feel like I'm missing something so simple, it must be right in front of me, but I'll ask anyway. Could someone please tell me where to find the fill-in information for the "name and license code" dialog box? I closed it before, then the program wouldn't open, so I deleted and re-downloaded it. Now I'm leaving it open until I find the right info. Thanks - look like a neat thing to have. You could click "ABOUT" and then "Enter License Code", but GOTD code will not work any more... Sorry. <b>MaryLee</b> You could click "ABOUT" and then "Enter License Code", but GOTD code will not work any more... Sorry. Installed on windows 10, click on icon and nothing happens. We discovered a bug in GOTD version of EasyNoter that forces the license validation each time the program runs. If EasyNoter can't access the Internet at that moment, you will get a message 'License expired'. Temporary solution is to allow EasyNoter to connect to the Internet. We plan to release a fix within 24 hours that will be delivered as EasyNoter update. We'll publish an update here whe. Sorry for your trouble and thanks for understanding. We discovered a bug in GOTD version of EasyNoter that forces the license validation each time the program runs. If EasyNoter can't access the Internet at that moment, you will get a message 'License expired'. Temporary solution is to allow EasyNoter to connect to the Internet. We plan to release a fix within 24 hours that will be delivered as EasyNoter update. We'll publish an update here whe. this update is available. Sorry for your trouble and thanks for understanding. When I go the registration page, I enter my name and email, and get "wrong capcha". Is there a specific GOTD name that should be used? Hi, how long does the license valid? Hi, the license is valid permanently, but the program must be installed and activated (automatically online) during the GOTD campaign. <b>hardgirl</b> Hi, the license is valid permanently, but the program must be installed and activated (automatically online) during the GOTD campaign. I can change the size of the display but the fixed characters (menus, data entry for reminders, etc.) are quite small and faint and do not scale. Is there a way to enlarge them? Well I got this far: "ArtPlus Easy Noter Pro 4.5 activated — what next?" and surely am wondering "what's next" because "activation" is as far as Setup.exe takes me. After I closed the "successful activation" dialog, its related "activated" web page opened in Maxthon Cloud--but the Easy Noter program did NOT install: the install dialog was empty and the title bar said "not responding." I'm using Windows 8.1 64 bit and I'd disabled Avast AV for 10 minutes beforehand to prevent interference. Disabling your AV is a good idea when installing apps using the GOTD setup.exe wrapper. I've been using this method after several failed installs in a row..........GOOD IDEA!! <b>Ms_Oyl</b> Disabling your AV is a good idea when installing apps using the GOTD setup.exe wrapper. I've been using this method after several failed installs in a row..........GOOD IDEA!! I do not speak polish and am unable to figure out how to get the key I need to start the software. Even with translation on, I only see comments when I go to the link provided, Any suggestions? Not sure what you mean... There is no Polish, nor any other language but English both in our program and on our site! <b>Lindsay</b> Not sure what you mean... There is no Polish, nor any other language but English both in our program and on our site! Just popping up to mention that the clock,date,time , month,graphic calendar and photos page things is the BONUSes for me. Many Thanks ... .. Art Plus Inc. and GOTD. Just popping up to mention that the clock,date,time , month,graphic calendar and photos page things is the BONUSes for me. What a Diary ... Many Thanks ... .. Art Plus Inc. and GOTD. Despite all the ruckus about a typo that was evidently fixed, I downloaded and installed Easy Noter Pro 4.5 with no problems. The interface has a nice layout - a welcomed change from the normal boring Windows look! I was able to add a couple entries into the address section with no problem, although I was not able to import from my previous address book as it saves its own proprietary format and does not allow changing to TXT. I used the "Help" section and was able to change the default font, and to cancel running at startup. So far I am pleased with this program and hope to use it for quite some time. Won't run unless you're online because it asks for the reg code and needs to be online to check it. However, once the reg is verified, you can disconnect and restart the program as many times as you want and it'll work -- until you reboot or run a cleaner program. Actually, we discovered a bug and will release a fix that will be offered as a regular update.Due to that bug GOTD EasyNoter checks the license validity each day which is not how it's supposed to work! If it can't connect to the Internet, it shows "License Expired" message. Once patched, it will no longer require Internet connectivity and will work offline and behind firewall. <b>wyndham wales</b> Actually, we discovered a bug and will release a fix that will be offered as a regular update.Due to that bug GOTD EasyNoter checks the license validity each day which is not how it's supposed to work! If it can't connect to the Internet, it shows "License Expired" message. Once patched, it will no longer require Internet connectivity and will work offline and behind firewall. Same result as the first test on a second machine running Windows 10 Pro 64. Blank dialog comes up that says "Setup" in the title bar, then a blue section with a white bottom section shows for about 5 seconds, then closes and GOTD installer says it is activated. Bryan, although I haven't run this install yet, I have seen GAOTD installs do the exact same thing, and I was able to install the program by temporarily disabling my antivirus (not something I normally recommend, by the way) during the install. For the security conscious (like myself) you can then run a FULL system scan immediately after the install to relieve any concerns about what happened during the install. <b>Bryan Mohr</b> Bryan, although I haven't run this install yet, I have seen GAOTD installs do the exact same thing, and I was able to install the program by temporarily disabling my antivirus (not something I normally recommend, by the way) during the install. For the security conscious (like myself) you can then run a FULL system scan immediately after the install to relieve any concerns about what happened during the install. EasyNoter works on Windows 10 Pro 64, but I guess there'sa problem with custom installer created by GOATD. Since it's a one day launch, we don't have enough information to help. Sorry. You can install the program from our site. Contact us through the form there and mention this incident. We'll help you install the program with our default installer. <b>Bryan Mohr</b> EasyNoter works on Windows 10 Pro 64, but I guess there'sa problem with custom installer created by GOATD. Since it's a one day launch, we don't have enough information to help. Sorry. You can install the program from our site. Contact us through the form there and mention this incident. We'll help you install the program with our default installer. Tried to do the install from the developer site and got the same result on both machines (minus the "Activated" message, of course). So it must not be the GAOTD installer. Too bad there's no install log to check out. I did what you said, and just received an answer from Scott Vanake, ArtPlus Software Support that literally said: "Sorry to hear about your problem. You'll have to contact GOTD for the code as they distribute a special version of the program that can work only with the code they'll give you. Program is distributed wrapped within GOTD installer and we can't offer any assistance with that. Sorry." In an hour this will be gone, and a lot of followers, like me, could not install it. :( GOTD should do something about to help us, as obviously is an issue with the wrapper. <b>To the Developer</b> I did what you said, and just received an answer from Scott Vanake, ArtPlus Software Support that literally said: "Sorry to hear about your problem. You'll have to contact GOTD for the code as they distribute a special version of the program that can work only with the code they'll give you. Program is distributed wrapped within GOTD installer and we can't offer any assistance with that. Sorry." In an hour this will be gone, and a lot of followers, like me, could not install it. :( GOTD should do something about to help us, as obviously is an issue with the wrapper. Yes that was the response I received as well. It is interesting considering the previous such giveaway that I had a problem with the developer worked with me to get it installed. Not a "sorry not our problem" response. Although in their defense the program is available free and one can get a new license code every few months. A bit of a pain but it is doable. I guess that is why they are not interested in helping further. <b>M. Kenia AHERN</b> Yes that was the response I received as well. It is interesting considering the previous such giveaway that I had a problem with the developer worked with me to get it installed. Not a "sorry not our problem" response. Although in their defense the program is available free and one can get a new license code every few months. A bit of a pain but it is doable. I guess that is why they are not interested in helping further. Unfortunately, it looks like this answer triggered other users, not just you, to contact us copying the suggestion. Scott had no instructions about how to handle this sudden spike, and had no way of telling which one, or how many of those are valid claims that we promised to solve this way. Anyway, we'll handle all those requests in the coming day or two. You will all be able to install the program even though the GOTD campaign is over. Please realize that our primary responsibility is towards paying customers, so please be patient. Thanks. Please check the answer I gave to M. Kenia AHERN. If you already contacted us, you can expect a solution within a day or two. Thanks for understanding. I did, and perfectly understandable. And as I said in my post, considering the product design registration is a lot different than the previous one that had issues (it is free by default with ads and renewable 3 month license codes to remove them), it made sense that the amount of support would be limited. That said I thank you for offering to fix this situation and of course paying customers will get priority. I would expect nothing less. Take your time, I am not in any hurry. <b>Developer</b> I did, and perfectly understandable. And as I said in my post, considering the product design registration is a lot different than the previous one that had issues (it is free by default with ads and renewable 3 month license codes to remove them), it made sense that the amount of support would be limited. That said I thank you for offering to fix this situation and of course paying customers will get priority. I would expect nothing less. Take your time, I am not in any hurry. LuckyStiff63 WOW! Talk about Paranoid; you make it sound like there is someone just waiting for you to disable your security software so they can dump malware on your computer. <b>LuckyStiff63</b> WOW! Talk about Paranoid; you make it sound like there is someone just waiting for you to disable your security software so they can dump malware on your computer. I can't get it to install on Windows 10 Pro 64. A blank dialog comes up with a blue top and white bottom, then closes after about 5 seconds. Then the GOTD setup comes back and says "Successfully Activated". But nothing is actually installed anywhere. Oh wow, this is absolutely adorable. I was in the market for one of these and ended up settling on TreeDBNotes as the basic version is free all of the time. But I think it's time for a change. For those who are wondering, you can indeed copy and paste directly into 'ArtPlus Easy Noter Pro 4.5' from a web page and other programs. That's a game changer in my mind. There's also a simple spell checker and text formatter included - sometimes you have to pay extra for that, not in this case! *IF* the Easy Noter community grew, it has the potential to develop a modder community - they could change the notebook's textures, functionality and GUI. Adding this functionality would make the program more 'sticky'. After that, please please add some sort of limited functionally that allows additional notebooks tabs to be created. I found the skinning option right after making this comment. Just absolutely awesome! <b>Michelina</b> I found the skinning option right after making this comment. Just absolutely awesome! I know it's in a good faith but you should probably tone it down a bit as people will think it's a fake review. Instead of helping you'll end up hurting program reputation. Woops, sorry about being so enthusiastic lol No harm intended. :) Never seen this kind of comment before, normally people are commenting negatively about nasty reviews, broken language and problem code around here and I thought a positive review was in order as for once something worked as expected. I'll tone it down next time. <b>From the Developer</b> Woops, sorry about being so enthusiastic lol No harm intended. :) Never seen this kind of comment before, normally people are commenting negatively about nasty reviews, broken language and problem code around here and I thought a positive review was in order as for once something worked as expected. I'll tone it down next time. I keep getting "Failed to Connect" does anybody know why? This has happened on many GOTD installs. While EasyNoter does occasionally try to check for updates online, it does not require an Internet connection, so this probably depends on a way how GOTD handles registration. You should ask for support directly from GOTD. <b>unkabob</b> Sorry to hear about your problem. While EasyNoter does occasionally try to check for updates online, it does not require an Internet connection, so this probably depends on a way how GOTD handles registration. You should ask for support directly from GOTD. Could be PC security. One way to find out, if you are willing to risk it, is close down all internet explorers and other programs, turn off any firewall or anti virus then see if it works. Turn it all back on again imediately. If it did work then somewhere in your PC protection there will be a way to tell it to allow a connection to all GOTD sites. Just what I would try. <b>unkabob</b> Could be PC security. One way to find out, if you are willing to risk it, is close down all internet explorers and other programs, turn off any firewall or anti virus then see if it works. Turn it all back on again imediately. If it did work then somewhere in your PC protection there will be a way to tell it to allow a connection to all GOTD sites. Just what I would try. Check my replies and you will find the fix. <b>unkabob</b> Check my replies and you will find the fix. I can't find any other replies by Val. I'm interested to see the one she refers to. How do I find it? <b>Val</b> I can't find any other replies by Val. I'm interested to see the one she refers to. How do I find it? If you use the "Find" (Ctl F) in your browser and type in Val you will find all my postings. "I goggled the problem and found a fix in a Evernote program discussion. Open Internet Explorer (even if you don't use it) and go toTools - Internet options -> Advanced (Tab) -> and Check "Use TLS 1.2" (or your highest version). It is not necessary to uncheck "Use SSL 3.0. I only have TLS 1 and I unchecked the SSL 3.0. in the light of Poodle bug. Maybe someone more techy than me can explain it but all I know is it worked. <b>David Murphy</b> If you use the "Find" (Ctl F) in your browser and type in Val you will find all my postings. I actually made the original comment and then when I found this fix and it worked I replied to it. Here is the answer again: "I goggled the problem and found a fix in a Evernote program discussion. https://discussion.evernote.com/topic/54945-cant-connect-to-server-please-try-again-later-i-have-a-great-internet-connection/?page=2 Instructions: Open Internet Explorer (even if you don't use it) and go toTools - Internet options -> Advanced (Tab) -> and Check "Use TLS 1.2" (or your highest version). It is not necessary to uncheck "Use SSL 3.0. I only have TLS 1 and I unchecked the SSL 3.0. in the light of Poodle bug. Maybe someone more techy than me can explain it but all I know is it worked. Actually, we discovered a bug and EasyNoter will ask for the Internet connection, and without it, it will pop the message saying that "License Expired"! That's a bug! We'll release a fix within a day or two and you'll get it within regular updates. After that fix is applied, EasyNoter will work as it should. It will no longer require Internet to function! This bug affects only GOTD version of EasyNoter. If you installed one from our site, you are not affected. Thanks for your reply. I found the change I made in Internet Explorer did work for downloading and installing EasyNoter. I've now been exploring the program and am pleased with it. Simple in it's design looking just like a little address book we might carry and yet it has spaces for many different notes and even reminders. The most interesting reminder I found so far is when it will open a program at a time I set. Not a huge need for that but I can see it would be handy when I want to limit my time when I get lost on Facebook or Pinterest. My only 2 negative comments are that the clock is hard to read and I haven't found a way to have it open in a different position. Neither one is a big deal because there is another clock on my computer and the program is easy to move and size. <b>Developer</b> Thanks for your reply. I found the change I made in Internet Explorer did work for downloading and installing EasyNoter. I've now been exploring the program and am pleased with it. Simple in it's design looking just like a little address book we might carry and yet it has spaces for many different notes and even reminders. The most interesting reminder I found so far is when it will open a program at a time I set. Not a huge need for that but I can see it would be handy when I want to limit my time when I get lost on Facebook or Pinterest. My only 2 negative comments are that the clock is hard to read and I haven't found a way to have it open in a different position. Neither one is a big deal because there is another clock on my computer and the program is easy to move and size. Or, you can skip the license and simply keep seeing our offers via ads in the program. Licensed program doesn't show the ads, so it's up to you to choose the option. <b>David Murphy</b> Correct :) You can do so forever if you don't mind coming to our site once in three months to see what else we eventually have to offer :) Or, you can skip the license and simply keep seeing our offers via ads in the program. Licensed program doesn't show the ads, so it's up to you to choose the option. Requires internet access to run, even after successful registration. After blocking in firewall, installed and registered program wouldn't open. Kept trying to connect to about five different IP addresses. Unacceptable behavior for this type of program. Uninstalled. Don't blame EasyNoter for that, but GOTD installer! EasyNoter doesn't require an internet connection! See my reply to "unkabob" above. <b>Nathan</b> Don't blame EasyNoter for that, but GOTD installer! EasyNoter doesn't require an internet connection! See my reply to "unkabob" above. Installed easily on Windows 10 64 bit. Nicely laid out and the customisation options are clear, clean and easy to use. Now have a changed screen resolution and GB English installed, which was a simple enough process. So far I am impressed and will be keeping this and giving it a good testing over the next week or so, whilst maintaining my current system for safety. I use Outlook for much of my work but can't say that I'm that that fond of it. I can see this being a good replacement for parts of it at least. I can't seem to leave feedback in the top section, so I would like to do so here - Using Microsoft Outlook is often necessary, but it would be helpful to import Contacts and Diary to Easy Noter, especially when it is used on USB across machines where Outlook is not installed. Thank you GAOTD and ArtPlus. Installed easily on Windows 10 64 bit. Nicely laid out and the customisation options are clear, clean and easy to use. Now have a changed screen resolution and GB English installed, which was a simple enough process. So far I am impressed and will be keeping this and giving it a good testing over the next week or so, whilst maintaining my current system for safety. I use Outlook for much of my work but can't say that I'm that that fond of it. I can see this being a good replacement for parts of it at least. I can't seem to leave feedback in the top section, so I would like to do so here - Using Microsoft Outlook is often necessary, but it would be helpful to import Contacts and Diary to Easy Noter, especially when it is used on USB across machines where Outlook is not installed. Thank you GAOTD and ArtPlus. BTW, you can import various formats, like CSV, plain TXT etc. You can probably export from Outlook to one of those formats. I know it's not a direct import as it should be, but it should work, only in two steps instead of one. <b>Kestrel</b> You're welcome :) BTW, you can import various formats, like CSV, plain TXT etc. You can probably export from Outlook to one of those formats. I know it's not a direct import as it should be, but it should work, only in two steps instead of one. You can find more info here: http://www.artplus.hr/adapps/eng/easynoter_help.htm Hope that helps! It looks like a good little notebook for keeping track of things like dates and such. My only qualm is you cannot enlarge the note book. Additional dictionaries can be downloaded for it. Mine is in Canadian English now. essencial is another way of spelling essential. You can enlarge it simply by clicking "full screen" on the upper middle left page. <b>Robert George</b> You can enlarge it simply by clicking "full screen" on the upper middle left page. The notebook can be enlarged by pointing to any edge and pulling outwards to the size you want. <b>Robert George</b> The notebook can be enlarged by pointing to any edge and pulling outwards to the size you want. True in Catalan and Portuguese, but not in English. <b>Robert George</b> True in Catalan and Portuguese, but not in English. It's free today so no complaints, but confused. Easynotes Free has adverts. Easynotes paid which was supposidly $24.95 reduced to $9.95, is the same program without them. 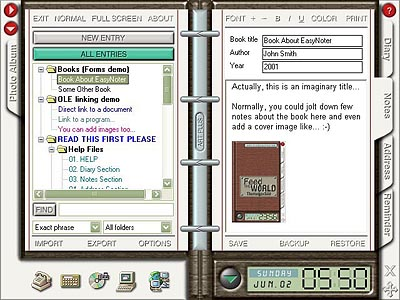 The developers website also has the EasynotesPro still for sale at $24.95. No indication of any differences between paid and pro. Actually, it's the same program. It just displays ads about our other programs. As long as you don't mind that, you can continue using it without registration. Alternatively, you can opt to visit our website to get a new free code every three months. This too will remove the ads. Either way, the program will not expire. You'll only start seeing ads when the free license expires. And finally, there is a paid option that helps future development, and removes ads and the need for license renewal. <b>George</b> Actually, it's the same program. It just displays ads about our other programs. As long as you don't mind that, you can continue using it without registration. Alternatively, you can opt to visit our website to get a new free code every three months. This too will remove the ads. Either way, the program will not expire. You'll only start seeing ads when the free license expires. And finally, there is a paid option that helps future development, and removes ads and the need for license renewal. I'm actually in the market for something like this at the moment. The thing that's putting me off, though, is that the dev can't spell "essential". How can we trust the software is there are spelling errors in the description? I'm actually in the market for something like this at the moment. The thing that's putting me off, though, is that the dev can't spell "essential". How can we trust the software is there are spelling errors in the description? We are not here to test their literary skills but their software. It would appear they are from Croatia, English is not their first language. Instead of blaming them, blame the idiot who destroyed a language with illogical spelling, Dr Samuel Johnson. <b>Keya23</b> We are not here to test their literary skills but their software. It would appear they are from Croatia, English is not their first language. Instead of blaming them, blame the idiot who destroyed a language with illogical spelling, Dr Samuel Johnson. Keya23 O, eye dunno, betta a typo en da descripshun dan a typo en da kode witch wuld mayke it crush alla tyme, ryte? Translation for those who wish to live in a perfect world. Oh, I don't know, better a typo in the description than a typo in the code which would make it crash all the time, right? <b>Keya23</b> O, eye dunno, betta a typo en da descripshun dan a typo en da kode witch wuld mayke it crush alla tyme, ryte? Translation for those who wish to live in a perfect world. Oh, I don't know, better a typo in the description than a typo in the code which would make it crash all the time, right? Everyone will likely have an opinion on this issue, but I tend to agree with you : The main reason being that a spelling error in the main headline indicates lack of precision, and that lack of precision could be extended to the precision of their software coding. There are dictionaries, especially if one is a second language speaker -- all the more reason to be precise and use it ! Last but not least, software programmers / website designers that have never heard of spell-checkers ? <b>Keya23</b> Everyone will likely have an opinion on this issue, but I tend to agree with you : The main reason being that a spelling error in the main headline indicates lack of precision, and that lack of precision could be extended to the precision of their software coding. Besides : There are dictionaries, especially if one is a second language speaker -- all the more reason to be precise and use it ! Last but not least, software programmers / website designers that have never heard of spell-checkers ? Salvia LOL. So we can blame Samuel Johnson for the following spelling inconsistencies: floored, ford, horde, board, toward, chord, gourd, gored, poured, sword? These words rhyme with each other but all seem to follow their own rules when it comes to spelling them. It's no wonder English is so difficult for people to learn as a second language. As for ArtPlus Easy Noter I have been looking for an easy way to keep the many files I have on my computer and will be giving this one a good try over the next few weeks. Thanks to Giveawayoftheday and to the devlopers for making this available. <b>Salvia</b> LOL. So we can blame Samuel Johnson for the following spelling inconsistencies: floored, ford, horde, board, toward, chord, gourd, gored, poured, sword? These words rhyme with each other but all seem to follow their own rules when it comes to spelling them. It's no wonder English is so difficult for people to learn as a second language. As for ArtPlus Easy Noter I have been looking for an easy way to keep the many files I have on my computer and will be giving this one a good try over the next few weeks. Thanks to Giveawayoftheday and to the devlopers for making this available. English is a hodgepodge of languages and Johnson apparently kept the original spelling from each of these languages. If he had the logic of a programmer he would not have acted in such a stupid manner. A language that is easy to speak when compared to Latin-based languages and nightmare to write and read. For instance you can spell fish ghoti using pronunciations in English.